With college graduation pending, the old gang tries to avoid the inevitability of breaking up and going forward with their lives. 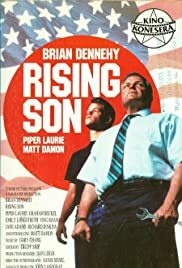 I think I originally picked up my VHS copy of "Rising Son" over two years ago. It took until now for me to get around to watching it. I'm not sure why that is, but the low rating here on IMDb (5.8 at the time of this review) might have had something to do with it. Now that I've seen the film for myself, I can't begin to explain the reasons for this underrating. The main motive one might have to seek out this film is the stellar lead performance by Matt Damon (it was his first). For such an inexperienced actor, he displays remarkable talent. Unlike some actors in their early roles, there's no sense of inability or lack of focus. Brian Dennehy, the other lead performer, offers the best performance I've yet seen of him. Dennehy, who's often been hired to play gruff, violent types, gets the chance to display somewhat of a deeper humanity here. The expectation, denial, and ultimate self-hatred of his character is painfully deep and believable. It's quite a journey. Other well-known actors offer quite wonderful performances. This includes Piper Laurie, Ving Rhames, Richard Jenkins, and a young Jane Adams. John David Coles displays an excellent understanding of his actors, giving them the chance to really give life to their characters. This is an ability he displayed equally well the previous year, with "Signs of Life". Unfortunately, he went on to work almost exclusively in episodic television. I really like what Sandi Sissel does with the cinematography. She takes her extensive experience with documentary film-making, and applies it to drama. The result is a film that looks far more real than most. I've seen more films than I can count about bad choices and job dissatisfaction, but never one with as much depth and humanity at this. I wish that everyone who feels trapped with their careers, their families, their own selves, would see "Rising Son". It's that true, that real, that complete, that painful of a film.